AI is powering products, processes, strategies and customer experience in the Banking industry. The banking industry is all geared up to embrace Artificial Intelligence (AI), to address its business requirements. In general, banks are struggling to implement smart services within their compliance framework, and have an incomplete view of their customer needs from their legacy systems. However, the industry continues to be reliant on legacy systems, largely because of the involvement of too many complex platforms, technologies, and systems which make migration or integration cumbersome. Meanwhile, modern Digital Banks are aligning their services to customer needs by embedding AI and machine learning within their existing systems. The banking industry’s experimentation with AI is opening new opportunities for improving customer experience (CX). “We are not too far away from a day where traditional enterprise applications are no longer relevant. The purpose of those traditional systems was to simplify, codify, and automate business and customer processes. But in the mid-term future, we will have a time where the entire process is intelligent – where the system/application creates the best business process for the customer on the fly”, says Tim Sheedy, Principal Advisor, Ecosystm. Banks are being transformed through AI adoption, especially in areas such as process automation, cyber security (especially in threat analysis and intelligence, and fraud/transaction security) and better information sharing systems for both their corporate and retail customers. Customer Service is one of the core banking applications. Adoption of technologies such as virtual assistants and natural language processing (NLP) techniques is redefining CX in the banking industry. “With emerging technologies setting a new bar for personalisation and value-add, banks looking to stay ahead of the curve simply cannot afford to ignore them,” says Jannat Maqbool, Principal Advisor, Ecosystm. Personalised financial advice is another area where banks are taking advantage of AI applications. While it might be a perception that AI will reduce the human touch when it comes to CX, in reality, it provides more accurate and timely assistance. For instance, Bank of America has built an AI virtual assistant, “Erica” which actively assists 25 million clients on its mobile platform. Erica searches for past transactions and informs customers on their credit scores and connects with them to provide analytics and information on their account. As profit margins decrease in the Banking sector, and Fintech technologies become more mainstream, banks need to ramp up their marketing initiatives, to remain competitive. 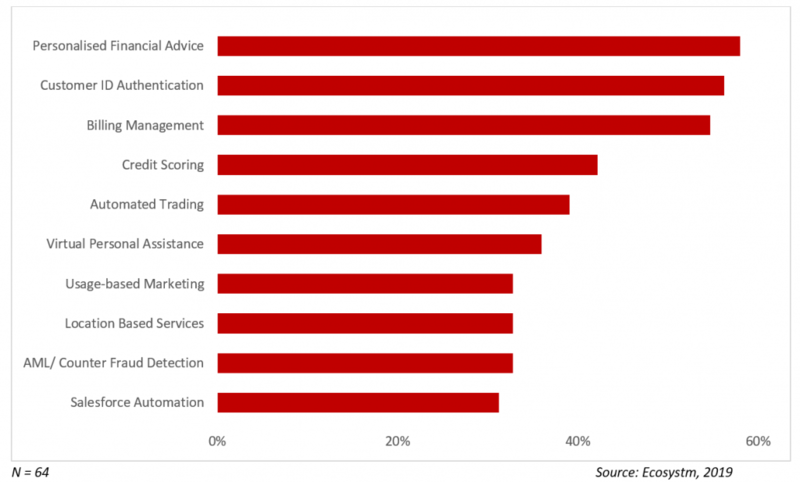 AI is helping banks to optimise their marketing dollars. Machine learning algorithms can analyse customers’ entire banking journey involving interactions, transactions, location history, and usage patterns to develop insights and make marketing decisions with unprecedented accuracy. Decisions on a range of marketing initiatives across product improvement, new products and services offerings, and targeted marketing keeping in view customers’ financial goals will be automated. This will impact the profit margin as sales cycles shorten, and customers banking journeys become more satisfying. There are certain functions in banks which require a lot of manual labour such as billing, generation of reports, account opening operations, KYC, etc. AI is transforming the banking industry with data-driven processes and decision making to automate tasks such as billings, credit scoring, compliance reports and so on. This not only reduces the dependence on tedious manual processes but also creates mechanisms to reduce errors. These errors not only make the organisation less efficient but also has financial ramifications. UBS, as an example, has introduced robots to its workforce, mainly at the back offices, designed to execute more manual and repetitive tasks. This essentially means meeting the right tasks with more speed and accuracy. AI improves with data and learns behavioural patterns. Banks are utilising this data or claims management and fraud detection. The AI platform evaluates on certain parameters such as when and how a customer typically accesses services and manage their money – more importantly, how they do not. They are designed to flag transactions with missing information and can alert the bank staff to irregular transactions and suspicious activities to prevent fraud. Increasingly this is evolving a chain of an automated process, without the involvement of banking staff or customer complaints. Banks have a difficult job delivering better service while remaining compliant, and AI-driven AML and KYC initiatives, helps prevent fraud, and flag suspicious activities such as money laundering. 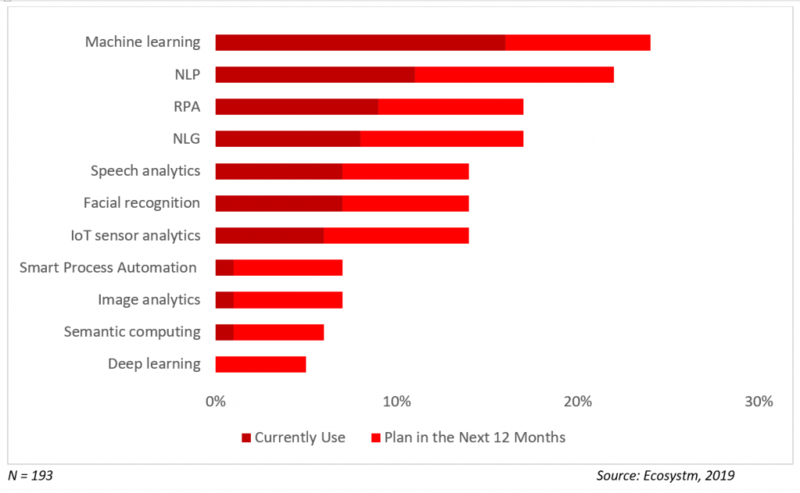 Current Focus on AI – The banking industry’s focus on customer service and automating manual processes is reflected in the top AI solutions that they are currently adopting. Chatbots and virtual assistants are being improved through natural language generation (NLG) and speech analytics capabilities. Process automation through RPA is being integrated into the organisations’ digital journeys due to its relative ease of deployment and measurable ROI. Future Focus on AI – Banks will continue to focus on CX and strengthening the capabilities of their customer service team through AI. Niche solutions such as facial recognition will also improve their front-end operations, especially in customer identity authentication. Banks will also go beyond customer management to asset management, with AI-enabled IoT systems. AI is fast evolving and there are some excellent opportunities for banks to explore on what AI has to offer. Banks are working on feeding data into AI systems with advanced algorithms to better understand their customers and improve their services. Banks should focus on getting quality inputs on inquiries, interactions, transactions or another way that can collect insights. Consumers are looking for operations and systems that are simple to operate and directed towards them. The greatest potential for AI in banking is to deliver personalised and automated services to consumers in a cost-effective and efficient way. AI is allowing banks to do quicker operations at much lower cost, what remains to be seen is how banks further leverage AI to extend its products and services offerings.